Mother’s Day is every day. 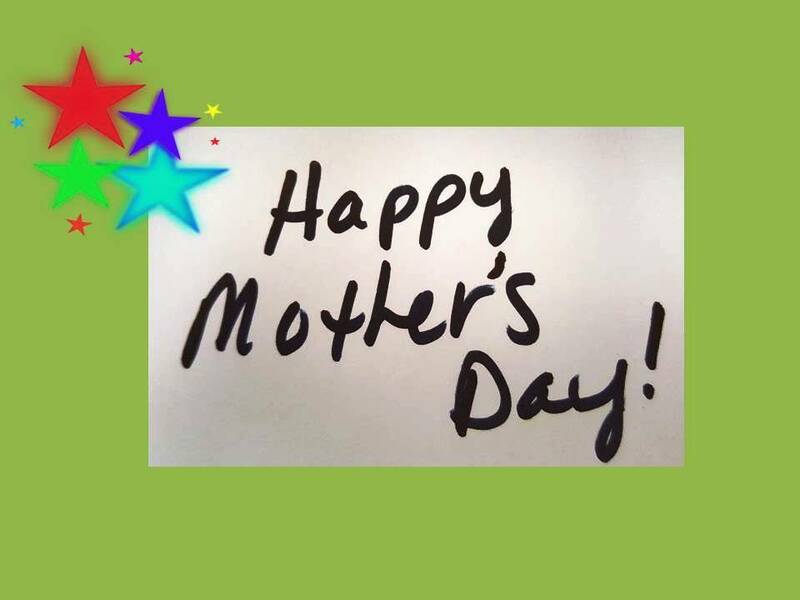 If you are a mom or have a mom or mother figure that poured her life into yours, you know that. The second Sunday in May, the nation pauses to celebrate the virtues of motherhood. Its a nice gesture and an economy booster. According to an annual survey conducted by the National Retail Federation, Americans are expected to spend about $172.00 on their mom this Mother’s Day on anything from a combination of cards and candy, flowers, Mother’s Day Brunch and more. 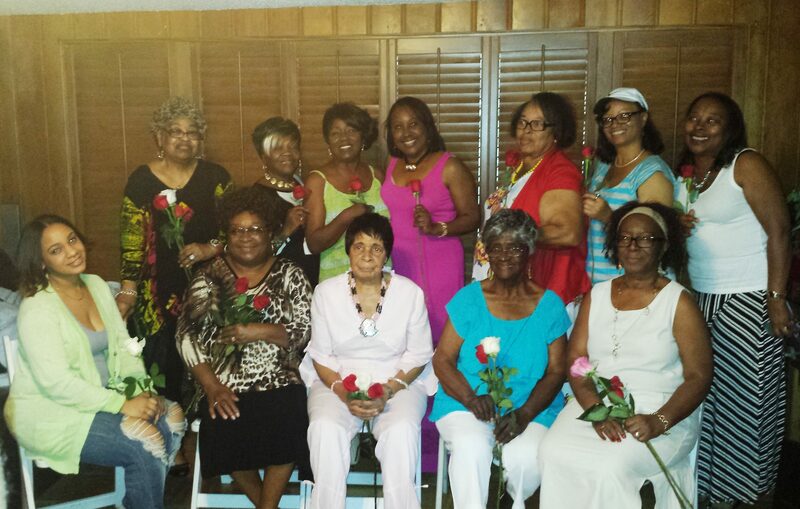 Some of the best and memorable Mother’s Day gatherings for me have been the brunches my oldest brother Montie and his wife Mary host at their home each year for the mothers in our family. I love last year’s picture of our generation of Mothers. Please excuse the red eye – we are amateur photographers. The best things in life aren’t always free. The soiree my brother and his wife hosts cost a pretty penny to be sure, and we appreciate them so much. But the best things in life are always from the heart. I am not sure what your plans are for Mother’s Day. But whatever they are, I hope they include doing something special for your mom, mother figure or yourself and reflecting on the memories and values your mom and cherished caregiver imbued in you, where she is living or departed. Mark that moment by making something special from your heart, and by your hands. 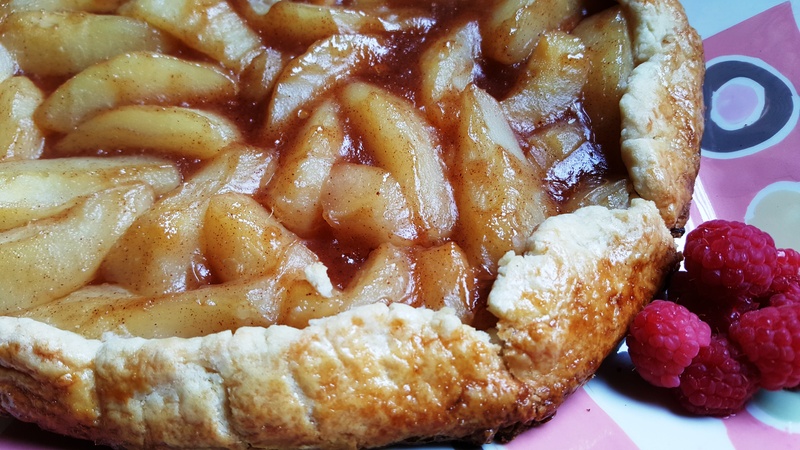 My easy Humble Pear Tart is the answer. It’s a mash up of comfort and decadence. And it will cost more of your time than your money. For this recipe, I made my own pie crust which is a very basic recipe. A quick egg wash makes it golden brown. Make it for your mom or for yourself. Have a slice with ice cream for dessert, or have it with a cup of coffee at breakfast. Savor each bite of this light and delicate pastry, reminisce and give thanks to the woman who gave you life and the woman that nurtured your soul. Happy Mother’s Day to you all. Drain the juice from the canned pears but reserve ¼ cup of pear juice and set aside. Make a slurry by adding cornstarch and reserved pear juice in a small bowl. Mix well with a fork until corn starch is thoroughly incorporated and there are no lumps. To a large sauce pan add drained pears, cinnamon, nutmeg, vanilla, and salt. Pour cornstarch slurry over pears. Mix gently. Over medium heat bring contents to a gentle simmer and continue to stir until the slurry thickens and begins to cling to the pears. This takes about one minute after it starts to simmer. 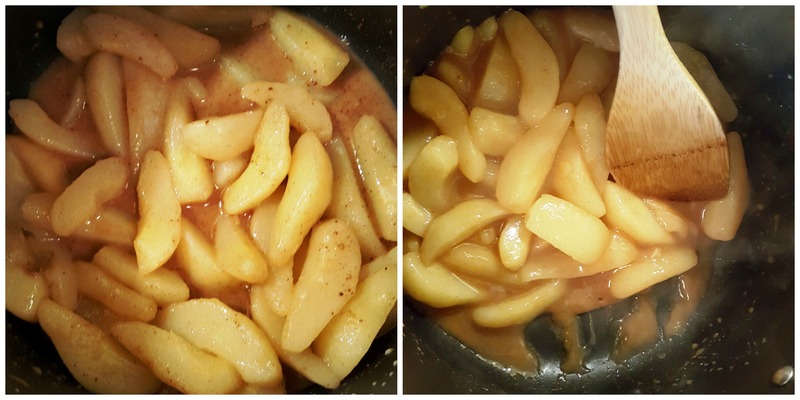 Left: simmer pears. Right: thickened sauce clings to pears when done. 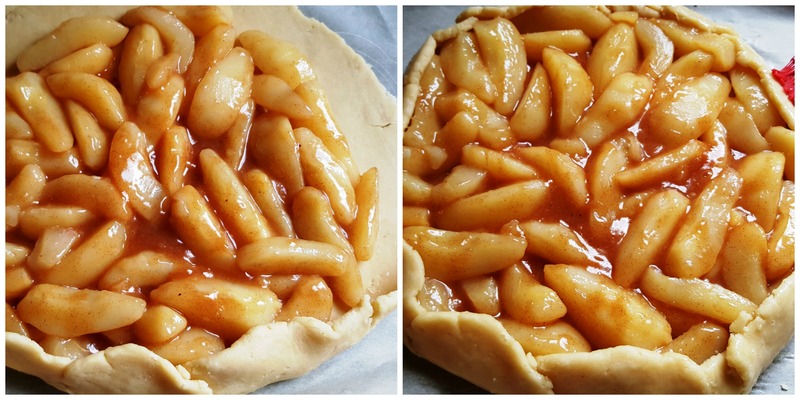 Left: pear filling on pie crust. Right: edges folded over filling and egg wash applied. 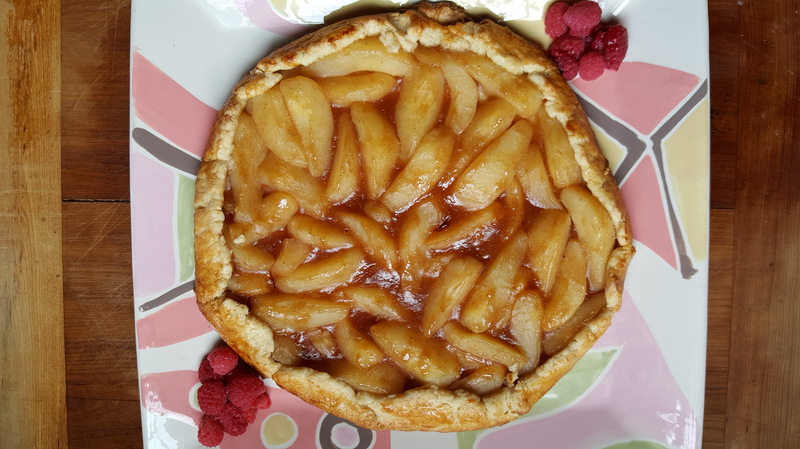 Bake the tart at 350° for 30 minutes or until golden brown. Mix flour and salt in a large bowl. Add shortening or softened butter and water into flour mixture. Mix using a pastry blender or fork. When the dough holds together, shape it into a ball. Place dough ball on a lightly floured piece of parchment paper. 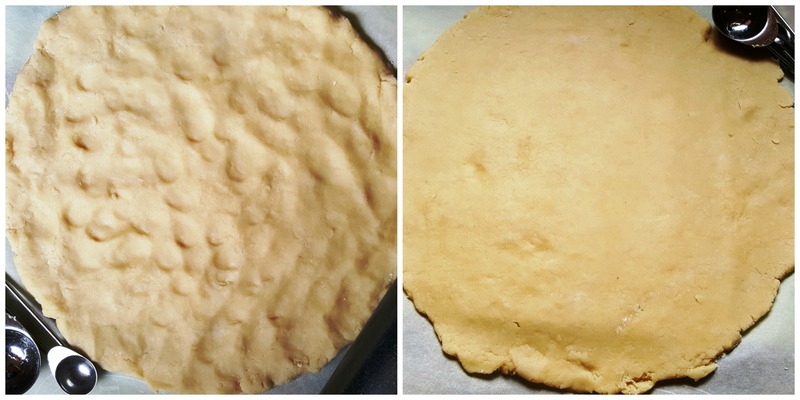 Begin to flatten the dough with your finger tips from the center outward to the edges into a 9 inch circle. Finish by using a rolling pin to roll the dough into an 11 inch circle, making sure to roll from the center outward to the edges. Break one egg into a small bowl. Beat egg gently and brush on pastry to help promote browning. This entry was posted in Foodies. Bookmark the permalink.